The line graph below shows the number of complaints received by the complaints department of a single airline over a six-month period in 2009. 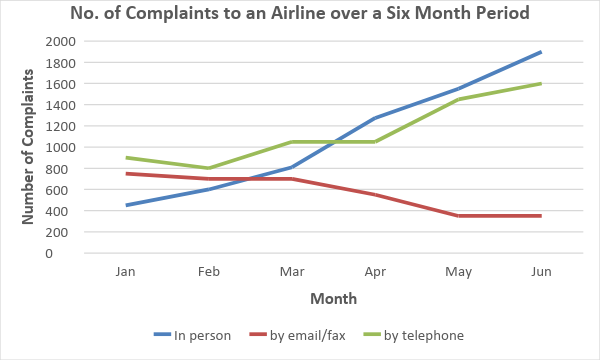 The line graph compares the number of complaints made to an airline’s complaint department by three different means, personal delivery, telephone, and fax or email, during the first half of 2009. Overall, the airline received an increasing number of spoken communications from airline passengers, as compared to a declining preference for written ones over the time frame shown. Face-to-face complaints showed the most dramatic increase over the six months. In January, complaining in person was the least popular way to criticize the airline with only 400 complaints recorded. By mid-March, this figure had surpassed other contact methods to finally reach over 1900 complaints by June, an almost fivefold increase. By the same token, telephone complaints increased, though less dramatically. In January, there were 900 complaints registered, which dipped and fluctuated slightly for the first few months, before increasing significantly after April to 1600 two months later. Complaints that were written showed an inverse trend. In January, the airline was contacted almost 800 times by email or fax, which then remained relatively unchanged for the first three months before halving to just under 400 by the middle of the year. Summarise the rise in popularity of spoken responses in communicating with the airline alongside the fall in other means of complaining. Past perfect and past simple tense is used here. Face-to-face complaints showed the most dramatic increase over the six months from the least popular way to complain to the most. In January, travelers complained over 400 times in person, surpassing other contact means in mid-march to a figure almost five times the original by June. By the same token, complaints by telephone almost doubled over the period, being made 900 times at the start of the year, dipping and fluctuating slightly, before increasing significantly after April to 1600 by June. The line graph compare the number of complaint made an airline complaint department by three different mean, personal delivery, telephone, and fax or email, during first half of 2009. Overall, airline receiving an increasing number spoken communication from airline passengers, as compared to declining preference for writing ones over the time frame shown. Face-to-face complaints showed the most dramatic increase over six months. In January, complaining in person was the least popular way to critique the airline with only 400 complaint recorded. By mid-March, this figure had surpassed other contact methods to finally reach over 1900 complaints by June, almost fivefold increase. By the same token, telephone complaints increased, though less dramatically. In January, there were 900 complaint registered, which dipped and fluctuated slightly for the first few months, before increase significantly after April to 1600 two months later. Complaints that are written showed an inverse trend. In January, airline was contacted almost 800 time by email or fax, which then remained relatively unchanged for first three months. Before halving to just under 400 by middle of the year.